Free in-game loot every month, plus surprises! -- You'll get characters, vehicles, skins, and boosts for games like Hearthstone and Smite, plus surprises like a copy of Streamline the day it launches. Ad-free viewing plus a free channel subscription every 30 days! -- Support your favorite streamer, plus get exclusive emotes, more chat colors, and crown yourself with the chat badge of royalty. Member discount on new release box games! -- Your exclusive pricing even applies to pre-orders and collector’s editions, plus get pre-order price guarantee and release-day delivery. Watch thousands of movies and TV shows! -- Including Ex Machina, Doctor Who, The Man in the High Castle, Legend of Korra, Firefly, and Thundercats. Ad-free access to over a million songs! -- Tracks and albums from Calvin Harris, Major Lazer, Gorillaz, Coldplay, game soundtracks, and more. -- Over 20 million eligible items. Also get free same-day delivery on over a million items when shipping to selected metro areas across the U.S. If you don't have a Prime account yet, start your free 30-day trial! 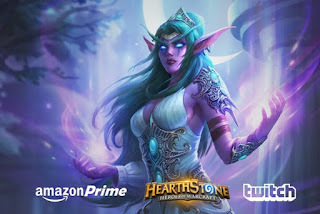 -- Prime members now get Twitch Prime in addition to Free Two-Day Shipping, exclusive access to movies, TV shows, ad-free music, unlimited photo storage, Kindle books, unlimited listening to audio series and more!